Last week I found myself driving along a long stretch of highway in Texas, several hours between here and there. And then, unexpectedly, I see a sign along the highway: "Bakery ahead". Did I really see that? Yes, I did, because there's another one: "bakery ahead" with a little arrow pointing to the left. You can bet your bottom silver dollar pancake we pulled over at the next turn signal. 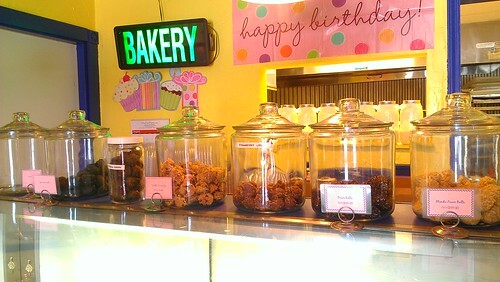 What we found, quite unexpectedly, was a gluten-free, no-refined-sugar bakery, smack dab in the middle of Texas. 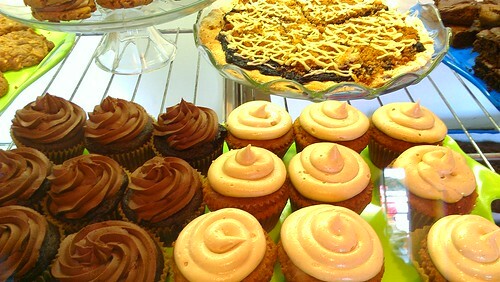 No Regrets Bakery is the name. "No offense", I said to one of the owners, Casey Harris, "but you're kind of out of the gluten-free belt." She was kind enough to laugh at this, acknowledging that it was certainly the truth, but that their trailblazing had been rewarded: this was their first anniversary, and they'd gained a cult status with locals and those not-so-local. Turns out that just because this type of bakery isn't common in Texas doesn't mean that there isn't a demand. "This bakery is our way of paying it forward, our blood sugar came back high twice and that was enough to scare both of us. We changed our lifestyle and diet, lost a lot of weight (60lbs and 40lbs) and our blood sugar stabilized at low normal. My husband never stopped craving sugar so I started manipulating recipes to replace the refined sugars and then started removing wheat flours to remove the simple sugars, replacing with gluten-free flours to make a baked good with higher protein and more complex carbohydrates. I started as a cottage industry out of my home and then received a call that a restaurant wanted to carry my products and No Regrets was launched with the location on HWY 287 in Alvord, TX." 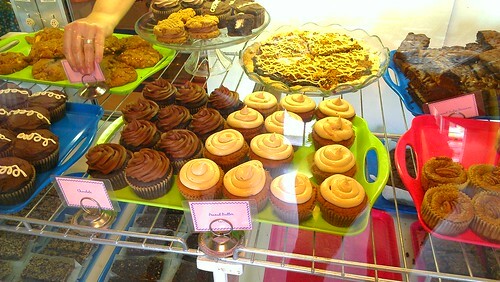 I realize that the idea of a gluten-free, "paleo-friendly" Hostess style cupcake might frighten my sugar-loving friends. Or that the idea of a birthday cake made with coconut flour might sound downright strange. Or that the idea of homemade protein-rich bars full of flax and berries might just sound like hippie food that isn't worth your time. Listen, I don't really care how they do it, because the most important thing here is that what they make at No Regrets Bakery tastes good. 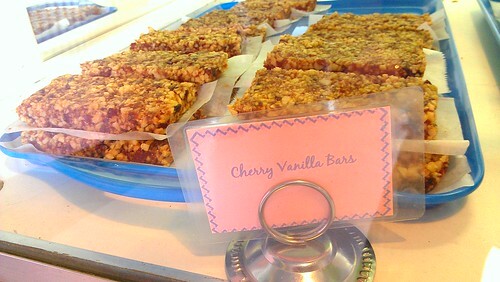 Here's the raw/vegan cherry vanilla bar, filled with dried cherries, dried cranberries, flaxmeal and vanilla stevia. It was actually a very good bar. Homemade versus store bought, when it comes to granola type bars, makes a big difference. This one had a really nice tartness from the cranberries, too. I approve. 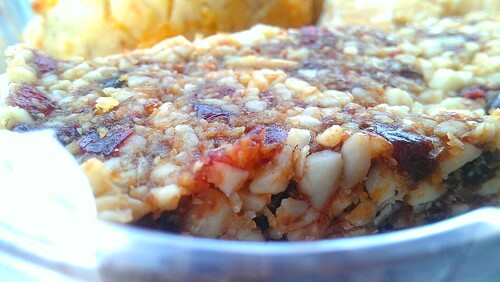 We also got a "Chocolate Pecan Bar", made with cocoa powder, toasted pecans, dates and dried cranberries. It tasted like a Lara Bar, but better. 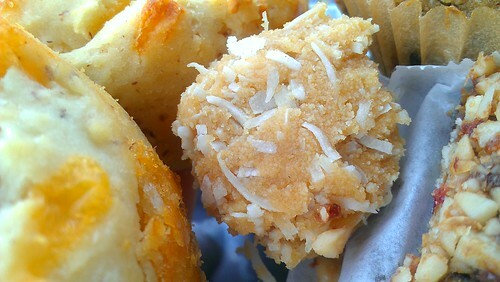 We also got one of the "power balls", with almonds, almond extract, unsweetened coconut, maca and agave. It was a decadent and tasty little morsel. 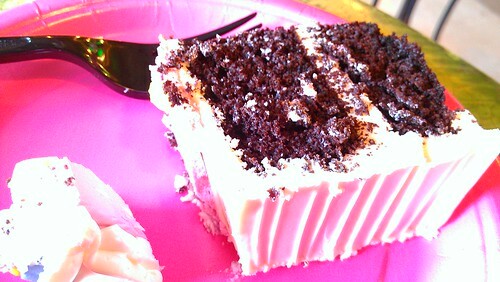 And they were giving out slices of birthday cake because of the aforementioned anniversary! This cake did not taste like deprivation at all. The chocolate masked any coconuttiness from the coconut flour, but it definitely tasted lightly nutty in a good way. 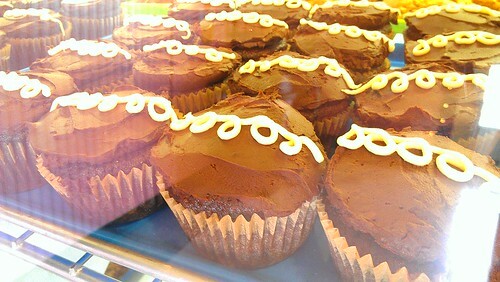 The frosting, which is agave-sweetened, didn't have a weird or artificial taste, which pleased me. I can deal with a cake like this, if this is what gluten-free cake can be. We also picked up a doggie cookie for Porkchop the pug. I don't think he cared that it was corn and wheat free--he just ate the thing. Overall, this was a magical stop in Texas. Hit them up if you find yourself on highway 287! Or, help them out with their fundraising goals to open a second location in the Dallas metro area. 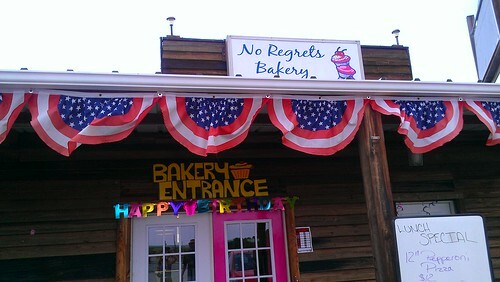 No Regrets Bakery, 8879 Highway 287 North, Alvord, TX. Online here.